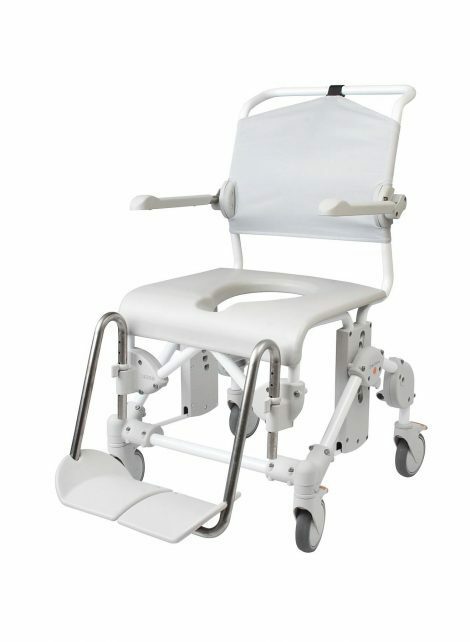 The Swift Bariatric Shower Commode Chair is well suited to the larger user. Ideal for use in home settings, nursing homes, healthcare facilities and hospitals. You will have all the benefits of the Swift Mobile line, plus the robust design caters to the needs of the larger user. Do not worry about squeezing into tiny chairs. This chair is 54cm wide. You will feel secure knowing that the Swift Bariatric Shower Commode Chair will support you with ease. The chair comes included with the necessary accessories and provides the options for more should you need it. Standard pan holder is included. Width between arm supports can accommodate 54cm. Back support is nylon, non-stick, quick drying and adjustable. Foot supports are curved, protect the users side heel and swing away for convenience. You can tailor this chair to each individuals need with a wide range of accessories.